This tattoo is a prime example of popular Blackwork of today. 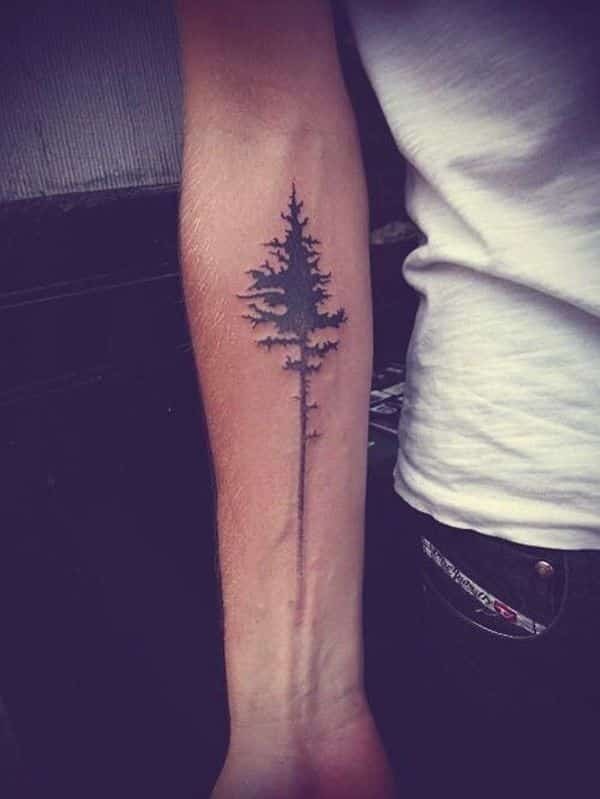 On the inner arm, a thin tree trunk grows up from the wrist toward the elbow. It is topped with scraggly, reaching limbs that serve to give off an air of mystique and wonder. This New School styled sleeve wraps around the forearm. 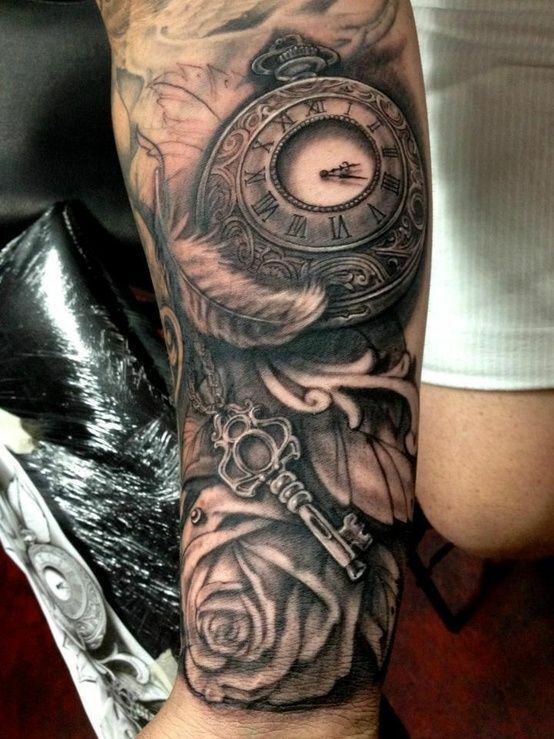 At the top of the forearm, an intricately detailed pocket watch sits on a bed of expertly shaded feathers. A glinting key hangs beneath the watch, surrounded by realistic roses. 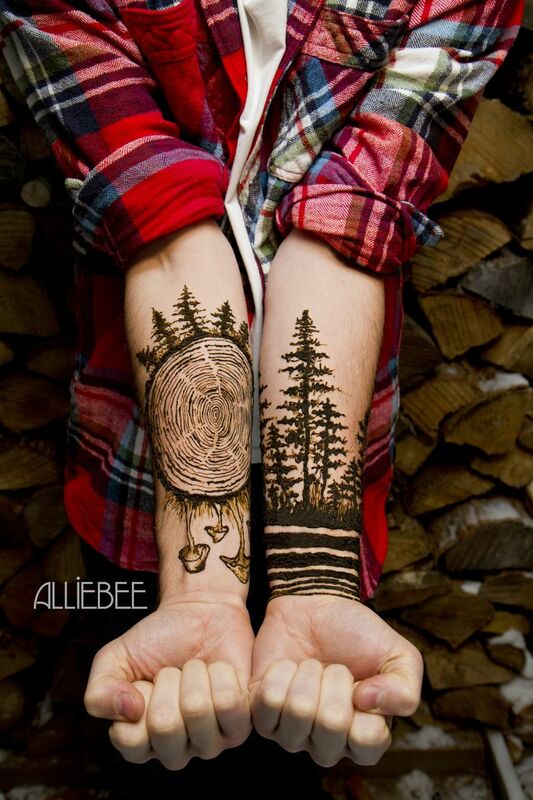 The right forearm features a wrap around Blackwork design of Impressionistic arm bands and reaching trees. The left forearm features a huge circlet of ringed tree wood. Atop the circlet stretches a matching Impressionistic forest; from the bottom of the wooden ring grows a patch of mystical mushrooms. 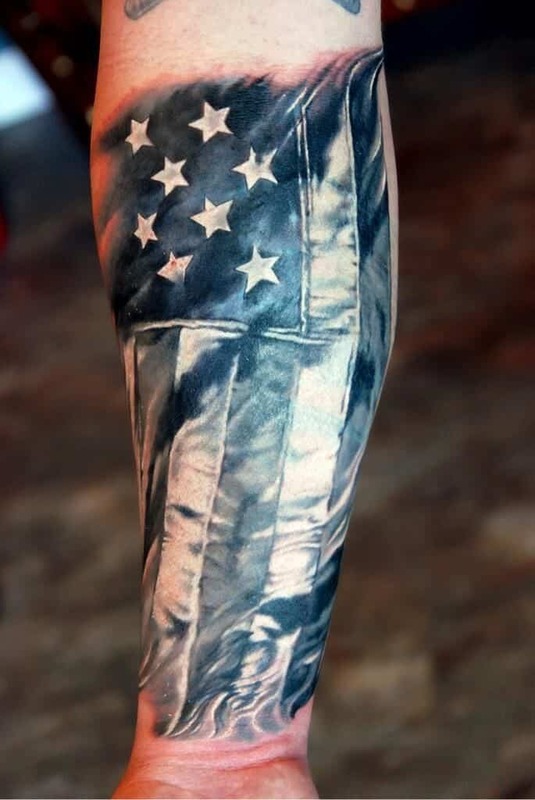 This realistically styled piece is a great forearm tattoo for men looking to show their patriotism. A grey scale American flag billows from elbow to wrist on the inner arm, expertly shaded to appear as if it is flapping in the wind. 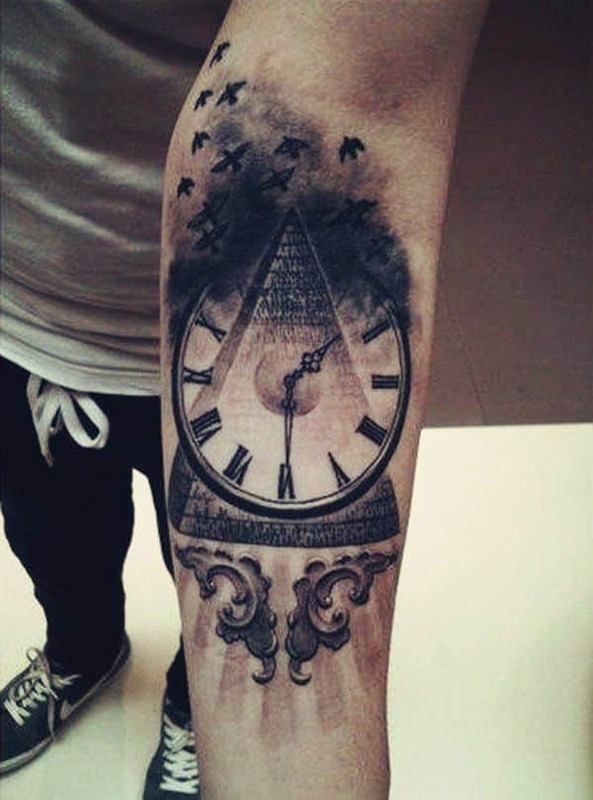 A large Egyptian pyramid sits at the center of the inner arm, encircled by a ticking Roman Numeral clock. It is embossed with ornate swirls and bursts of light. Its peak fades into a black pastel cloud, and birds soar up the arm. The right outer forearm features a large, solid cross done in Blackwork. On the left arm, a forearm sleeve done in New School style depicts a swirling scene of shadows, stars, and Gothic text. 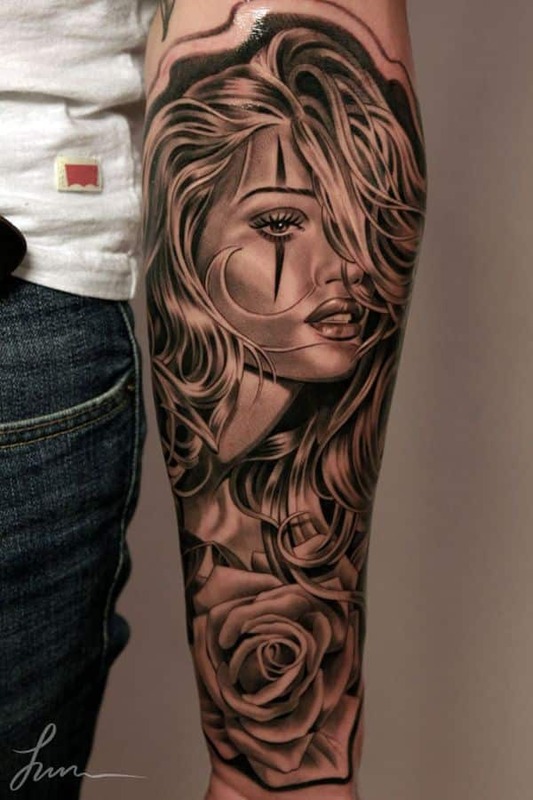 This tattoo adorns the inner forearm and features a realistically inked black and white sleeve based around the image of a woman’s face. Her pouting lips are encircled by billowing hair that frames her expertly shaded face. The sleeve tapers off at the wrist with a large, detailed rose. The right inner forearm is adorned with the skull of a bird, the top of its head covered in a cropping of tiny leaf-like feathers. From its talons stretch two ornate claws; from the feathers twist two mystical horns. 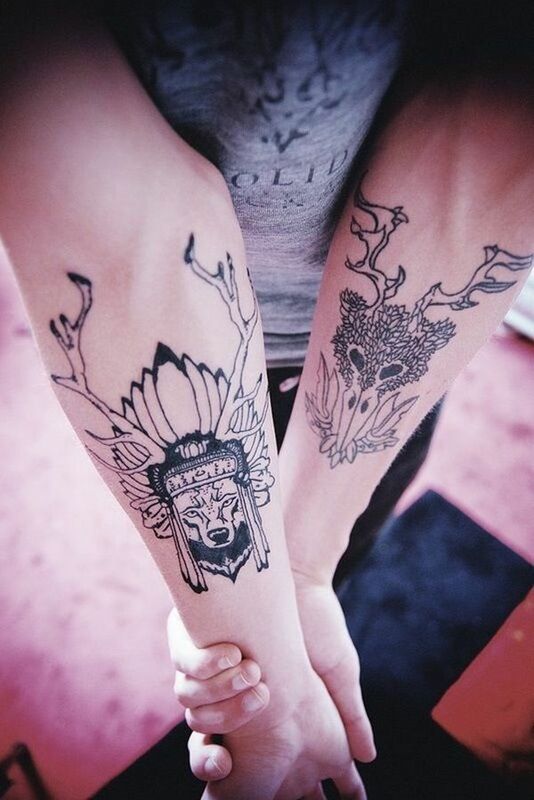 On the left inner forearm, a wolf wears a detailed headdress. Its large feathers surround two strong, tall antlers. 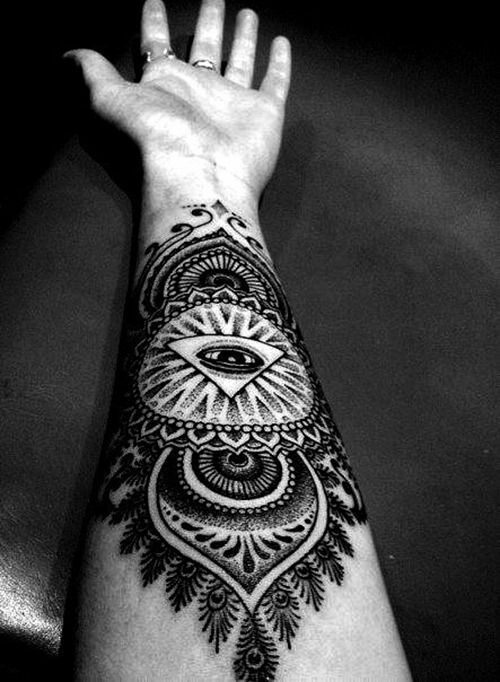 This Dotwork styled tattoo is based centered around a black and white mandala. At the center of the mandala, a triangle holds a suspicious looking eye. Tribal styled patterns burst out to fill the arm with an intricate symmetrical sleeve. 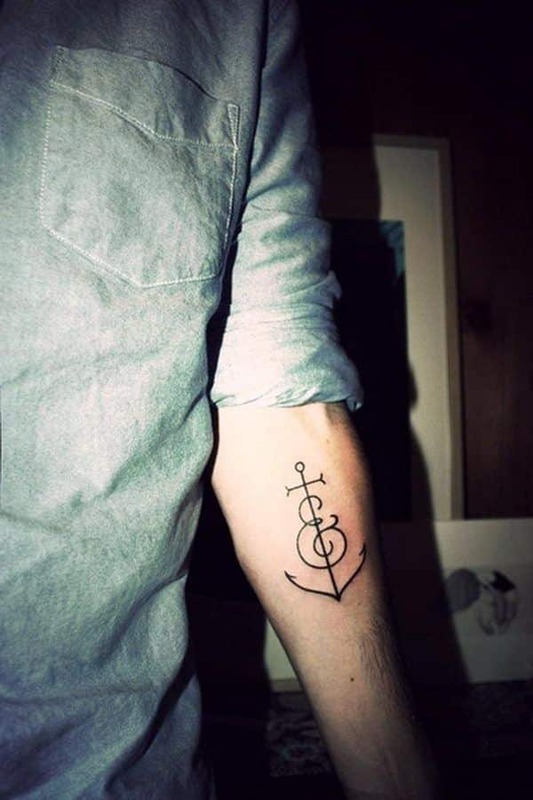 This simple tattoo sits just beneath the inner elbow. It features an anchor inked in thin lines, overlapped by a fancy, cursive writing scripted ampersand (&) insignia.